« Episode 92: Interview – Cheni Yerushalmi, co-founder of Sunshine Suites, a unique office space for entrepreneurs. 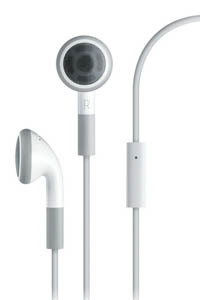 Does a great pair of earbud headphones for the iPhone exist? I sure haven’t found one, but lets find out. It was updated in 2013. I don’t know about you, but those are just 5 of the types of things people say to me as the owner of an iPhone. By the way, the reference of “Your father is kissing a lizard” came from the sitcom Good Times, when they were on the phone and mishearing things, and then they figured out – and were devastated – when they realized the other person was saying “You father is stuck in a blizzard.” That’s right, I just made a Jimmy Walker joke. Dynomite. 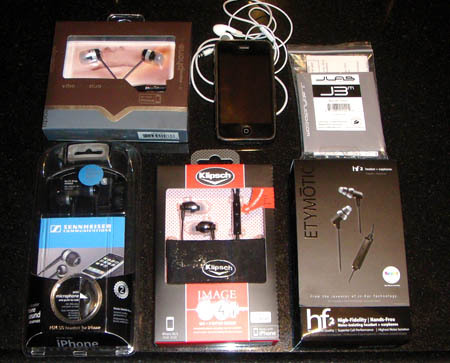 The podcast and blog this week is being done to accomplish three things, as we set out to find best earbud headphones for the iPhone. 1) On the personal side, after 2 years the right earbud on my iPhone 3G headset stopped working, so I need to replace them, hopefully with a model that cuts down the complaints above. 2) On the tech side, I wanted to do a comparison of the best earbud headphones on the market to see how they shaped up. 3) On the marketing side, I wanted to do a blog post that optimized the content, and try to appear on the first page of Google for the term “best earbud headphones for the iPhone.” You may have noticed that I’ve stated that phrase 4 times so far. As I mentioned, people have a really hard time with me talking on my iPhone. After the last few days of intensive testing, I’ve realized a few things. First, I live in Manhattan, a place where an enormous amount of your time is spent walking. Because most everyone here is an outgoing Type-A personality, you wouldn’t be caught dead just doing ONE thing like walking down the street. Oh no, you have to be talking on the phone or texting or chatting or jotting down notes for your next screenplay. Everyone is constantly on their phones. The problem is that you’re not sitting in a convenient “car cocoon” with your windows rolled up and the A/C slightly blowing at your feet during your commute. You’re in a massive city with beeping horns and giant buses and squealing cabs and constant construction in the background. Because you’re jostling around so much, it’s actually convenient to be wearing headphones with your iPhone, so that you can actually hear when some is calling in case you don’t pick up on the vibrate mode. Additionally, a great majority of people are on the subway. Once again, you’d rather be caught dead than simply sitting and reading a book or waiting for your next stop. It’s almost a requirement that you wear earbuds. During my testing, I realized I had to isolate the fact that I had two separate problems. The first is the sound quality of my headset. Whether it’s walking in the wind or talking while opening a bag of chips, the sensitivity of the microphone is a major factor that annoyed people. Second, is the quality of AT&T’s service. In addition to the 30% of dropped calls that AT&T says is within normal range for New York City, a new development in the past few weeks is that the quality of my calls is warbling my voice as I walk around the apartment. This is not a factor of the headset, but some crazy cell phone tower issue or something along those lines. Note: In November 2011 I changed from AT&T to Verizon. Let me be clear for a moment. I live in a 400 square foot studio apartment!!! We’re not talking the call quality decreasing when I move from the walk-in closet in my master bedroom suite to my downstairs kitchen with granite counter-tops to the basement home theater with concrete walls! I am moving within a 10 foot radius!!! I also want to say that I’m going to approach the testing in my own unique way. I’m not going to talk about the decibel crossover levels in the midrange tones or however the audiophiles measure it. In fact, because I’m a podcaster and mostly listen to speaking voices on my iPhone, I’m not going to go crazy worrying about the bass levels. I’m going to talk about the little things that I feel customers really care about, like the quality of the connection, the feel of the cord, the placement of the microphone, and whether or not it makes you look like you’re wearing jewelry. I’m even going to talk about the packaging. One of the interesting things I found, is that there was definitely no clear winner when reading reviews online. It seemed that nearly everyone had some kind of beef with whatever headset they had chosen. I was going nuts racking my brain trying to decide which one to buy, so in the end, I did the only thing a tech freak like me would do. I called up Amazon to check on their return policy (and I sure hope my Indian to English translation skills are accurate), and bought 6 different pairs of earbuds. Before we get to the reviews, a note on the marketing side. I think it’s pretty cool that when you search for “best revenue model for the iPhone,” my blog post comes up first. This is a pretty good accomplishment considering the popularity of the term iPhone. 4) linking to the products on a major site like Amazon or the product homepage. Nothing crazy. No custom HTML or paid search buy. Just a simple, organic blog post to see what happens. Jim says: Of course, I could have avoided all this testing by simply tossing my broken earbuds, heading over to the Apple store, and picking up a new pair for $29. In all, there is nothing wrong with these. They lasted me 2 years of harsh abuse, the sound was fine, and they fit me ok. However, people complained about the mic being too sensitive, so I was on a mission to find something better. 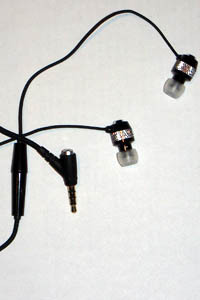 Jim says: At $39.95, the JBuds came in as one of the lower priced challengers. I’m not sure what the packaging looks like at retail, but when they arrived from Amazon, they were simply sealed up in a tiny ziplock bag. For the price, it was a solid all-around contender. For those on a budget, this might be your pick. 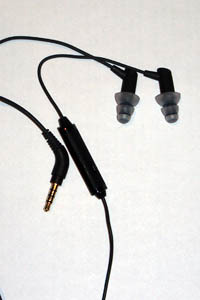 Earbud style/fit: Small, round silicone ear buds for an isolating-style fit. But they almost felt like they were going to disappear into my ear canal. Cord: Felt really flimsy and tangle-prone. Mic and control: Made of a large, kidney-shaped piece of plastic. This was the only model where the mic was on the left side of the headset. Your thumb naturally goes to the inside of the kidney to fast forward or pause, yet the button is on the opposite side. Jim says: Before I even got into testing, I had an immediate dealbreaker. 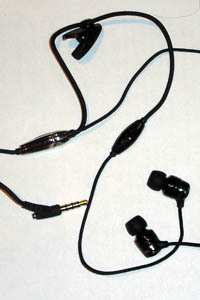 The headset is set up so that the right earbud cord is about 19″ long, while the left one is 5″ long. This might not be a problem for everyone, but based on where the mic was placed, it just felt wrong. There was a constant feeling that one side was heavier than the other. I also didn’t like the overall quality feel of the product. 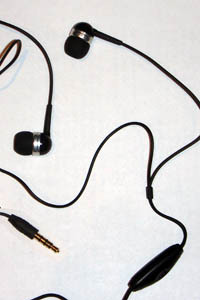 Mic and control: Unique in that the solid-feeling steel microphone is up high near your mouth, but the button to control answering calls or fast forwarding is lower, placed at the V in the cord. To me this isn’t a positive, as you have to reach down lower, sometimes within your coat, to find the fast forward button. The piece looks like some kind of multisided crystal, and you need to make sure you pick the correct side and dig your thumb in to the rubber button in order to press it. Jim says: These were pretty solid all-around, with some good heft to them. I really liked the cord, and the connection felt encouraging. While I might just need some time to get used to the controls, it felt unnecessarily clumsy. Purchase here: Jim note: These headphones may be discontinued, but are often available from various resellers. Check the V-Moda Headphones page on Amazon. Mic and control: The mic and control were housed in a single metal unit, which felt solid. However, the button was a little small to find and operate, and did not work for me. Jim says: On the plus side, I liked the construction, the cord, the plug, and the sound. But I also had several problems. As far as feel, the mic button is small and was a little tricky to operate. Next, I’m not sure if I got a defective unit, but the button didn’t work. Clicking it did not pause or fast forward to the next song. And it could have been me, but of the 7 audio tests I did, this one didn’t come out (sorry, time constraints prevented me from re-recording) Lastly, they were too blinged out for me. Mic and control: The mic and control were housed in a single metal unit, which felt very solid. They featured the new 3 button control for newer ipod models. Even though I still had a 3G, I thought it would be great to have if I move up to a newer model. The main issue is that the mic was located at the V, far below your mouth. They of course tout this as a positive, but my personal preference is to have it floating near my mouth, not bouncing around near my chest where I could have the zipper of a jacket, a tie, or the strap of my work bag. Jim says: I really wanted to like these, and enjoyed the way the earbuds sat in my ear. But below that, the wires just felt less sold, the connection worried me, and the mic placement sealed the deal. Cord: The cord was plastic but solid enough. Not the quality of the V-Modas, but better than the cheaper models. Mic and control: This was a single plastic mic unit with a button control. Pretty easy to find and use. Connection: The connection had a strong plastic feel that curved at almost a 90 degree angle, making it easy to add/remove it. Sound quality: As all the reviewers noted online, there is a noticeable absence of bass when compared to all others. While my sister said I sounded a little like a robot, and my parents thought it was a little tinny, they did say it felt a clearer. Decent audio in my test. Then as I was looking at the packaging again, I noticed there was a warning saying Important: a deep seal in the ear canal is essential, or there will be a loss of bass. Then they direct you to a video. The video is informative, amusing, and CREEPY all at once. They show a woman demonstrating how to properly put in the earbuds, which includes stretching your face with your opposite arm, and opening your mouth. I’m serious. However, I have to admit when I did so, I definitely felt a much deeper seal, and the bass improved dramatically. But now I had a new issue, the seal was TOO good. I felt that someone had poured wax into my ears and sealed them shut. While this was great for sound quality, there was a constant pressure there, and I was concerned about walking in Manhattan streets and having 80% of outside noises blocked. I guess you can’t have it both ways. Dealbreaker: The seal mentioned above, and price. Many people online paid the full $180 plus tax, which starts to put the total at the same level of the iPhone itself. I’ve seen them as low as $129. Jim says: I really didn’t want to like these because of the price, but ordered them anyway because of the numerous awards that were awarded to the HF2. But when I figured that I use my iPhone every single day, for multiple hours per day, they extra $100 or so would be a good investment over the next year or more. There was a sense of quality in the little things from both the headset and the packaging. I liked that I could pull these out * a little * so that I wasn’t yelling while on the phone, but push them back in for music or audio. I’m sure I put WAY more thought into this than the average Joe, that just strides into a store and grabs what the guy behind the counter recommends. (Hey, that’s why I’m here). 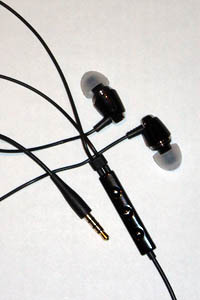 Note that every model provided multiple earbud gels to custom to your particular ear canal setup. Also, it’s tricky to get used to talking when your ears are completely sealed shut. Several also come with cases to carry the headphones in, but I’m not sure how many people will take the time to wrap up the headphones and carry them in a separate case all the time. Maybe women in a purse? I also want to tell people to remember that the noise isolation can cause you to zone out and miss sounds when you are crossing the street, trying to listen to announcements on the subway, or just interacting with people in general. Sadly, what I found out is that clarity in ALL of these products, especially on city streets, is an issue. With so many moving parts, from fit to electronics to finish quality, no wonder there is no clear winner. I ended up buying the V-MODA Vibe II in Feb 2010 and as of June 2012 I AM STILL USING THEM. Note… I live in Manhattan and use these EVERY SINGLE DAY. Some would say abuse them… I walk or take the subway everywhere, am on the phone constantly, and listen to podcasts 24×7. 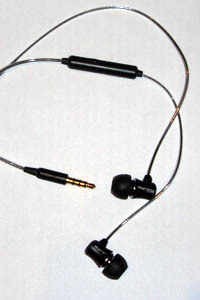 Furthermore, these headphones get wrapped up and shoved in and out of my pocket, jacket, backpack, etc all the time. It’s hard to believe they are still working, so I am happy that they have survived 2+ years, and would buy them again. Note that I have upgraded from an iPhone 3G to the iPhone 4S, and changed my provider from AT&T to Verizon. I now rarely drop calls, and they are much, much clearer. I hope the testing was helpful to you in making your decision. And from the marketing side, hopefully I’ll start to trend on Google for the search term best earbud headphones for iPhone. Hopkinson Report Disclosure: I am part of the Amazon.com affiliate program and earn a commission if you purchase products through this site. As always, I only endorse products that I have personally used. This entry was posted on Friday, February 26th, 2010 at 6:29 am and is filed under Apple, Branding / Advertising, Marketing Case Studies. You can follow any responses to this entry through the RSS 2.0 feed. Both comments and pings are currently closed.